The Bliz Whiz Ice Shaver has been re-engineered over this past winter to run smoother, more quietly and more user friendly. The Bliz Whiz is a compact automatic ice shaver. 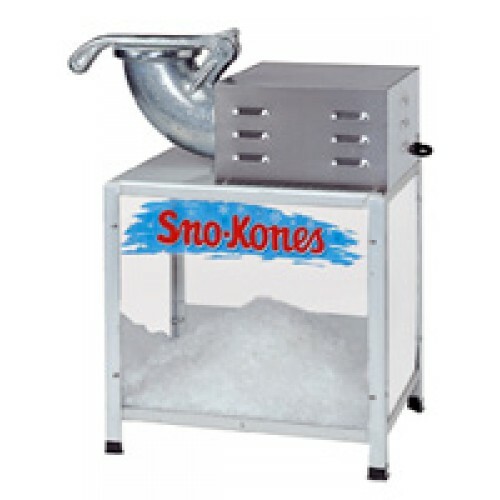 Simply shovel a large scoop of cubes or cracked ice into the hopper, close the lid with its safety switch and turn out very fine snow. The Bliz Whiz will shave up to 500 lbs. of ice an hour. 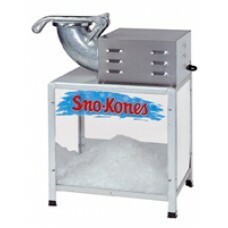 You can set the blades a little finer and reduce output slightly to get finer snow. Usually, colder chunk ice will shave finer. If it's too cold, it might stick to the hopper casting and not feed as well. So let it temper just a little by removing it from the freezer. The Bliz Whiz is the best looking regular size ice shaver in the industry. It's the easiest automatic, the safest, and with all of the improvements, you'll love the smooth operation.